The declaration was picked up by news outlets around the world and within weeks it was gospel: there is an old single malt Scotch whisky shortage. So is it true then? Well maybe. Sort of. Perhaps. The truth is, nobody really knows for sure. It does make sense that because single malt whisky has become so globally popular demand really has skyrocketed. And, as reported, it is true that some whiskies are dropping the age statements from their bottles, indicating that they're selling newer/younger products. And finally, many Scotch distilleries have only in the past few years added to their capacities, which means that the extra supply still has years yet to mature before it can be bottled. So all this would suggest that, should demand stay high, supplies of single malt whisky may be tight for some years to come. And this tightening of supply could lead to some very expensive whiskies. So what's a single malt whisky lover to do? If you don't feel like shelling out $500 for a rare, fine Scotch, we might have some great alternatives. We've spoken to a number of master distillers and ambassadors for different types of spirits about why single malt lovers might find their (often much lower priced) offerings just as exquisite and just as tasty. After hearing them out and sampling their art, we're convinced there's nothing to worry about. American Bourbon whiskey, like other whiskies, has become immensely popular in the past ten years, and both domestic and global demand has skyrocketed. Luckily, the major US distillers have reacted by increasing supplies, and numerous craft distillers have sprung up in the last decade to add their unique twists on the national spirit of the US. By law, to be labeled Bourbon, the whiskey must be made in the United States with a mash bill of at least 51% corn (barley and rye usually make up the remainder). It must also be barreled in new, charred American oak barrels. There are some proof requirements but there are no age requirements. Barreled whiskies that are sometimes aged for only a few months can be bottled and labeled bourbon. Most US Bourbon distilleries, however, do age their whiskey for a certain minimum number of years. Maker's Mark, for example, is aged for a minimum of five years and nine months. As can be expected, the longer it rests, the more expensive it's going to be. What turns many Scotch drinkers off of Bourbon, though, is the tendency of some distillers to use a high amount of corn, which makes the whiskey exceptionally sweet. Someone who is used to the dark, smoky and peaty Scotch probably won't find something with a high corn mash bill all that palatable. Luckily, though, not every Bourbon is made equal and some are on the lower end of the 51% requirement. This is especially true for Wild Turkey, which isn't nearly as sweet as many other brands, according to their Master Distiller, Eddie Russell, who told us that "Scotch drinkers would enjoy whiskies from Wild Turkey due to the high amount of rye in our mash bill." If you've ever tasted Wild Turkey you'll know this to be true - it has much of the complexity you'd find in a Scotch. Eddie went on to say that for Scotch drinkers he'd recommend a bottle of Wild Turkey Rare Breed, because he says it has "a big, bold flavor with lots of spice and tones of sweet tobacco." Rare Breed is a barrel proof bourbon made from a blend of 6, 8 and 12 year old stock that's uncut with water and instead bottled directly from the barrel. 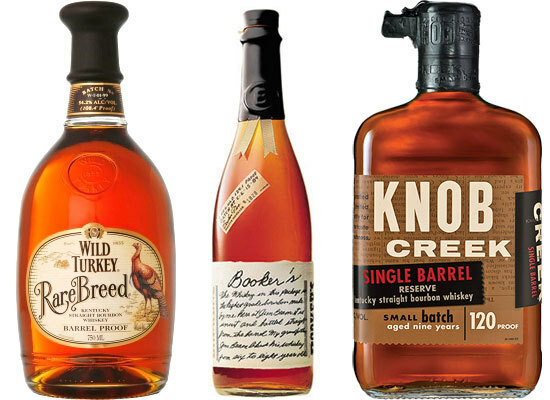 More and more Bourbon brands are doing this - barrel proofed whiskies that are typically aged for longer periods. Both Knob Creek Single Barrel and Booker's Bourbon (both by Beam Suntory and made at the Jim Beam Distillery) take this approach. Each is truly complex with higher proofs and rich, full tastes. Neither will be found too sweet to the palate and will, we think, be appreciated by Scotch enthusiasts. Rye whiskey was the drink of choice for Americans right up until prohibition. This was the stuff that started armed rebellions needing to be quashed by the U.S. Army. At one time it was cheap and prolific across the country, but it never really bounced back after prohibition the way other spirits did. Only in the past few years have consumers really started to take a liking to Rye whiskey, most likely because of its popularity among cocktail enthusiasts. Many of the bartenders at the trendier cocktail bars go to it especially for their classic cocktails, like the Old Fashioned or Manhattan. In the United States, to be considered a "Rye" the whiskey must contain at least 51% of the grain (for comparison in Canada there is no requirement and may not contain any rye at all). As a result, American Rye whiskey has a spicy, peppery taste and the more rye used in the spirit, the more powerful this spicy and peppery taste is. Also, unique to the United States, this whiskey must be aged for a minimum of two years in charred new oak barrels. Once this aging is complete, each distillery or bottler then chooses to do something different. 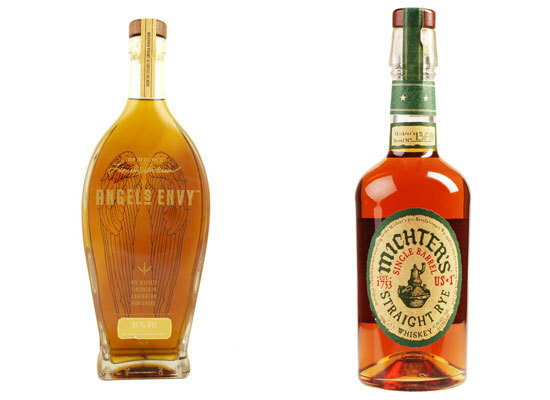 One particular rye that has exploded in popularity is Angel's Envy Rye Whiskey, a 95% rye variety which hit the market in 2013. Scotch drinkers are drawn to Angel's Envy because of the whiskey's complexity, according to Wes Henderson, their Co-Founder and Chief Innovation Officer. Wes told us that their complexity "comes primarily from secondary barrel finishes, which have been seen with Scotch whiskies for years." These secondary barrels are rum barrels which actually started life as Cognac barrels. Wes says that the secondary barrels "provide very unique taste profiles, and Angel's Envy is one of the first American whiskies to be successful utilizing this approach. " A different variety that uses less rye (51%) and then fills out the mash bill with corn and barley is Michter's Kentucky Straight Single Barrel Rye. According to Michter's Vice-President, Andrea Wilson, Scotch whisky drinkers will find "a smoothly balanced yet still spicy flavor profile with a hint of cracked pepper on the finish akin to the 'kick' you might have on a single malt finish." Andrea also noted that Michter's offers a barrel strength rye whiskey which "could be a choice for the Scotch whisky drinker who loves a dry, oaky finish." Though Irish whiskey has become increasingly popular lately, there may not be a single spirit that has had to face the hardships experienced by this storied whiskey. Irish whiskey is believed to have predated Scotch whisky and for a time was the most popular spirit in the world. In 1781 (perhaps the peak of the spirit) there were over 2,000 licensed and unlicensed distilleries in operation in Ireland. The same year private distilleries were outlawed and by the late 1800s there were only 28 licensed distilleries in operation. Those remaining distilleries were enormous though, producing an estimated 2 million gallons per year. But the "good times" were coming to an end. The early 1900s saw the start of a drastic change to the demand of Irish whiskey. This change can be linked to a handful of key events, including the introduction of the patent (or column) still, which many Irish whiskey makers shunned, a trade war between Ireland and England after the founding of the Irish Free State (which cost Irish whiskey distillers one of their largest customers, English drinkers), and the passing of the 18th amendment in the United States, the final nail in the coffin that shut down the majority of demand from the U.S.
Irish whiskey distillers continued to struggle and according to a report from the Irish Whiskey Association there were only 2 Irish whiskey distillers in operation in the mid 1980s. Blessedly, though, this all changed. In the late 1980s the Irish Distiller's became a member of the Pernod Ricard Group, with new distribution channels and a new marketing campaign that pushed the popularity of and demand for Irish whiskey into never before seen highs. By 2013 there were 4 distillers in operation and then 8 by the end of 2014. From 2003 to 2015 Irish whiskey sales increased 220%. It's safe to say Irish whiskey is back. So what defines Irish whiskey? For starters it must be distilled in Ireland (obviously). Also it must be distilled using cereal grains, and finally it must be aged in Ireland for a minimum of three years in wooden casks. It is usually, though not always, triple distilled, uses kiln dried barely (where most Scotch's use peat dried) and distilled using both malted and un-malted barley. To get an insiders take on this storied spirit we turned to Brian Nation, Jameson's Head Distiller and asked him what kind of similarities and differences Scotch Drinkers would find in Irish whiskey. First and foremost Brian told us that they both share a number of similarities. He said that "while each category has its individual subtleties and character, both often show fruity, full bodied whiskies that are underpinned by flavors of vanilla and toasted wood imparted by maturation in oak." One of the primary differences, of course, is that Irish whiskey doesn't have the smoky or peaty taste common to Scotch, but Brian explained this is a good thing, because it "allows the complexity of the whiskey to shine through." 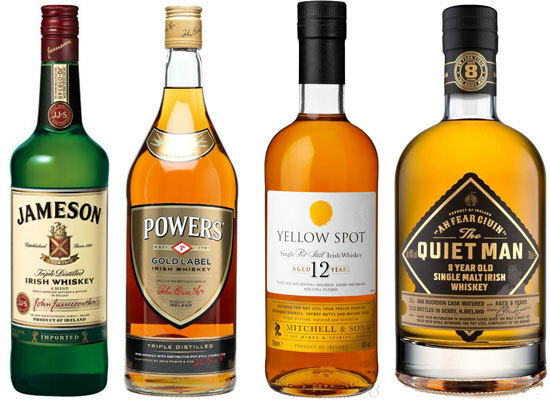 Also, thankfully, there is now an abundance of different fine Irish whiskies to choose from, including single pot still whiskies like Redbreast and Yellow Spot, more popular lines like Jameson (the most popular Irish whiskey in the world) and Powers (the most popular Irish whiskey in Ireland) and newcomers like Glendalough's Double Barrel and The Quiet Man. The selections and flavors open to an Irish whiskey newcomer or Scotch drinker convert are both numerous and distinguished. For those only familiar with the kinds of inexpensive tequilas used in equally inexpensive margaritas, this one might come as a bit of a surprise. Tequila though, like Scotch, can either be cheap swill or can be fine and sublime. Extra añejo tequila is most definitely the latter. The difference between extra añejo tequila and other tequilas lies in its aging. While some tequila barely see the inside of a wooden barrel, extra añejo rests in oak for at least 36 months (añejo translates to old). The resting allows the tequila to draw out the character and notes of the oak that really compliment and refine the smokiness of the tequila. Extra añejo tequila, as a result, has lost that edge, that razor across tongue heat that is so common in newer, cheaper tequilas. Instead these are smoky, spicy and smooth. They spread across your tongue with a creaminess that lingers and makes you close your eyes in pure joy. Each distillery takes a unique approach to how they age and finish their extra añejos. Tequila Avión, for example, ages their Reserva 44 for 43 months in oak barrels and then for one month in petite oak barrels which are rotated daily. Aging in smaller barrels gives the tequila an even woodier taste as there's more tequila to wood contact made. 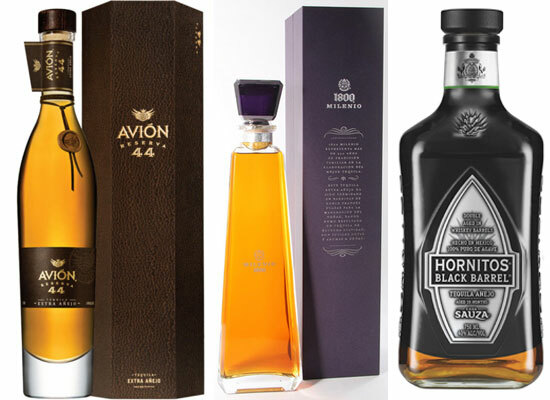 According to Tequila Avión Founder, Ken Austin, "by aging Reserva 44 for 43 months, followed by a 44th month in petite oak barrels that are rotated daily, a complex infusion of ripe fruits and fragrant American Oak is created giving our Extra-Añejo a rich, complex flavor experience many Scotch drinkers find appealing." He also adds that "Reserva 44 has been so popular that many people are comparing it to hard to find Whiskeys like Royal Salute 38 year old, and Yamazaki Single Malt 25 year." Other tequila distilleries take similar approaches. 1800, for example, re-released their Milenio Extra Añejo Tequila which is aged for 5 years in oak and then finished in French oak cognac barrels. Tasting nothing like tequilas you might be used to, this is much more a whiskey, and would also appeal to single malt drinkers. Yet a final approach is taken by the much more price-sensitive Hornitos Black Barrel Añejo Tequila, which spends a year in American oak barrels, then 4 months in "deeply charred" oak barrels, and then finally finished for two months in specially toasted oak barrels. The effect of all this is a tequila that's more like whiskey than tequila. It's woody, fruity and deeply rich, but retains the smokiness of the agave. Ultimately there's nothing to fret about. Scotch will still be around, and good single malts will still be found. Sure the market may be tight for a little while, but eventually when the whisky that's barreled from the increased capacity is released, the market will be back to normal. Until then maybe this is a great time to explore some other options, hopefully we've given you enough!